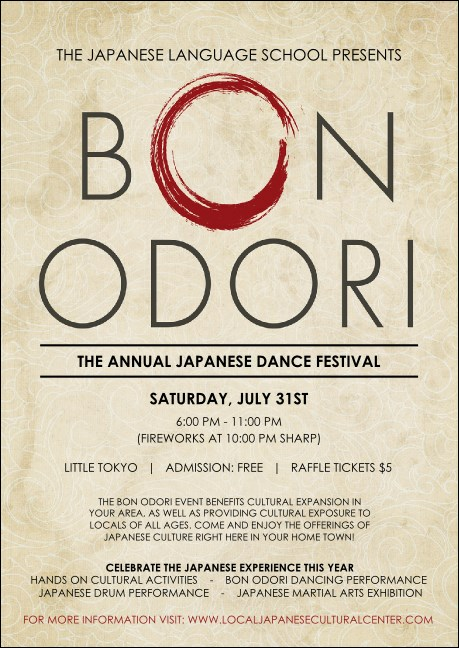 Attract a crowd to Obon by sending out Bon Odori Postcards several weeks in advance! This design’s nuanced backdrop highlights event details, which are presented in clear, modern typeface. The stroke of a red calligraphy brush in its title adds visual pop and echoes the shape traditional Bon Odori dances take. Inspire folks to save the date with professionally printed, polished-looking postcards from TicketPrinting.com.